The Pike, Tube or Flag Blennies, family Chaenopsidae ("Key-Nop-Sah-Dee") have elongated scaleless bodies that are compressed somewhat side to side, no lateral lines; modified for living in tube-like tunnels. Nine genera with at least eighty species, Atlantic and Pacific. Acanthemblemaria, Chaenopsis, Coralliocetus, Hemiemblemaria, Emblemaria & Protemblemaria are sold, mainly to reef keepers. 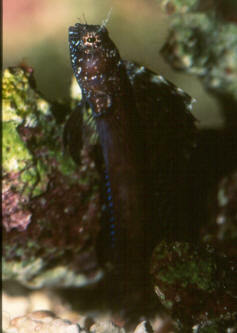 Acanthemblemaria aspera Metzelaar 1919 (Longley 1927), the Roughhead Blenny. Tropical West Atlantic. To 1 1/4" long. Conspicuous cirri above eyes; orange iris Color variable. Here in a hole in Key Largo. A yellow variant below in Cozumel. Acanthemblemaria castroi Stephans & Hobson 1966, the Galapagos Barnacle Blenny. Southeast Pacific: endemic to the Galapagos Islands. To two inches in length. Here in the wild. Acanthemblemaria hancocki Myers and Reed 1936, Hancock's Blenny. Costa Rica and Panama. To 4.5 cm. Costa Rica (Pacific side) 2011; below by DiF in Cabo San Lucas, 2016. 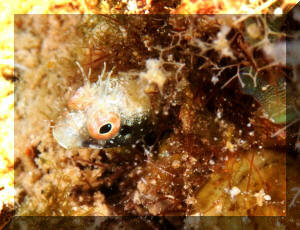 Acanthemblemaria spinosa Metzelaar 1919, the Spinyhead Blenny. Tropical West Atlantic. To 2.8 long. Note green "Google" eyes. Here in a hole in Cozumel. Below: Roatan 2019 pic of a male. Hemiemblemaria simulus Hildebrand 1940, Wrasse Blenny. 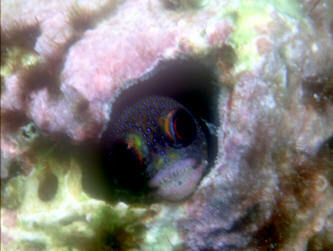 Tube dweller that sneaks out mimicking female Blue-Headed Wrasses to nip other fishes... also a consumer of copepods. To 4 inches max. length. Here in Key Largo 2014.